Pazham Pulissery: Pazham Pulissery is a traditional sweet and sour ripe banana curry. Pazham Pulissery is served in a typical Kerala sadya or Onam sadya towards the end of the meal. It is usually served as an accompaniment to rice. 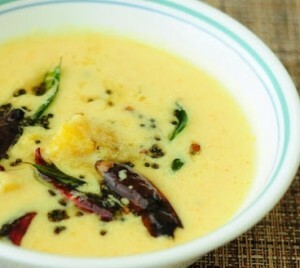 Pulissery is a spiced buttermilk curry with a coconut base. The coconut is ground with spices much like for thoran but the curry is sour (puli=sourness) due to the yogurt/buttermilk we add in. Grind grated coconut with green chillies, turmeric powder and cumin powder to a paste, in a blender. Cut ripe banana into medium-sized cubes. Put the cubed banana in a vessel along with required water. Add the mustard seeds to the hot oil. When it splutters, add curry leaves along with chopped onions and red chillies. Add the coconut paste obtained by grinding. When it starts to boil, add butter milk. Pazham Pulissery is ready to be served. Serve Pazham Pulissery with steaming rice. If you have any queries about this Pazham Pulissery Recipe , please write down in comment box below.